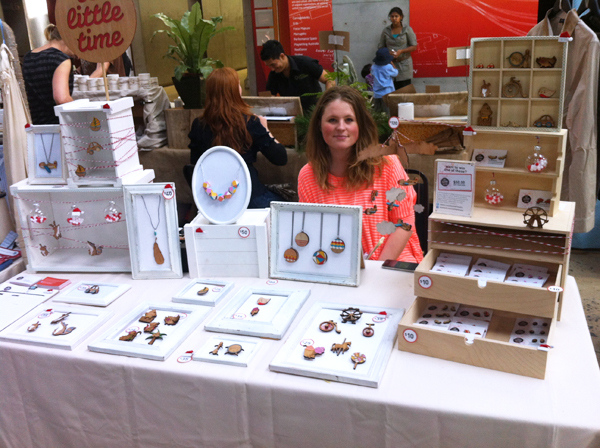 FK chats with Kirsty Eckard from jewellery label, So Little Time Co.
Can you tell us about your super cute label, So Little Time Co? So Little Time Co. was started by myself and my husband Josh in 2010. 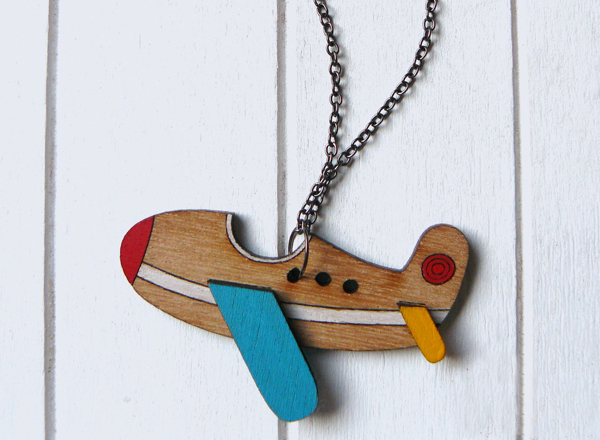 We make illustrated and hand-painted wearables, such as brooches, earrings and necklaces from laser cut wood. Some of our wearables move, some have material or needle work involved and some are just delicately hand-painted, but each piece in individual and one of a kind. Im the designer and Josh is the muscles, I draw, paint and stitch and he hammers, glues and sands. I really feel like So Little Time Co. is an extension of my own creativity. I wanted to make something that I enjoy, and to watch others enjoy it just as much is an incredible feeling. The name So Little Time came from the original items we were making when we first started, that being watch items, but even though we have stopped making those items, I really feel the name applies to so many aspects of the business and life, and people so easily relate to it. 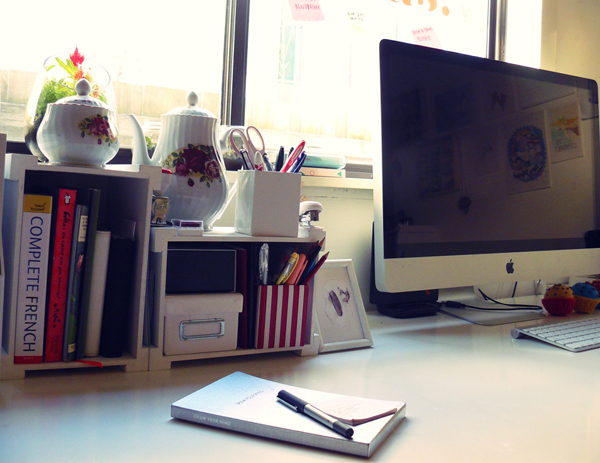 It all began in my first year in the real world as a graphic designer. After quickly realising that so much of the work I was doing was controlled by the client and not creativity, I soon found myself wanting create on my terms rather than someone else’s. After a night of talking about what I could do with Josh, I spent hours writing down ideas, sketching, researching and working out what exactly it would be that would allow me to create something that would make me happy, and something that I could share with others. 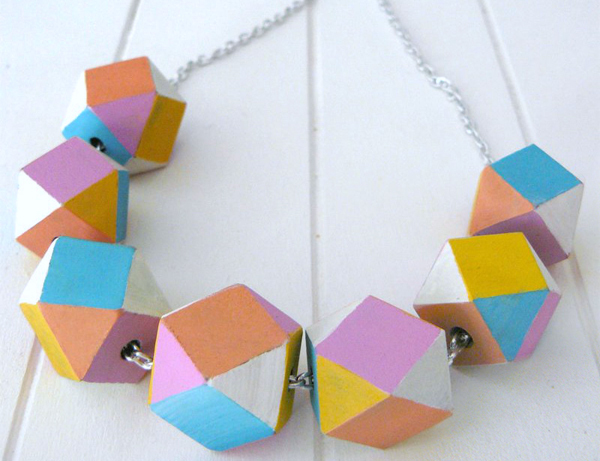 I had always loved jewellery, particular pieces which included wood and my ever supportive husband quickly went out an bought a jigsaw to try his hand at cutting the first piece ourselves. 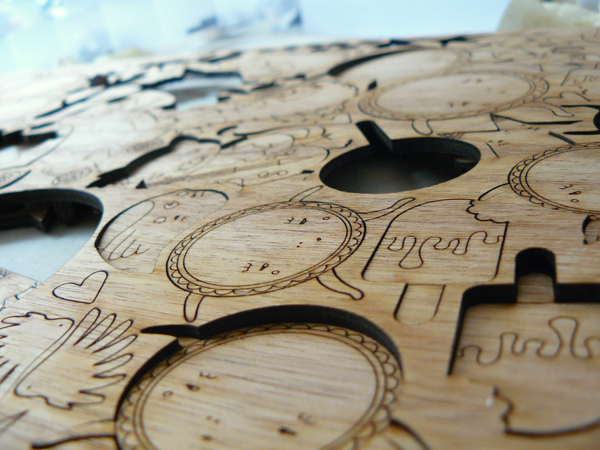 After much testing we decided laser cutting was the best way for me to combine illustration, wood and wearables as I like to call them, and and after receiving a small laser cut sample back, I soon realised how fun the process was. I think there is this need in me to create with my hands rather than a computer, and to create for me rather than being controlled by a client. I get alot of joy and satisfaction out of that and it’s probably where the whole thing started in the first place. What materials do you work with, and what is your design process? When we first started researching and coming up with ideas, I decided early on that I wanted to support local business with my own business and make sure that everything was sourced locally. 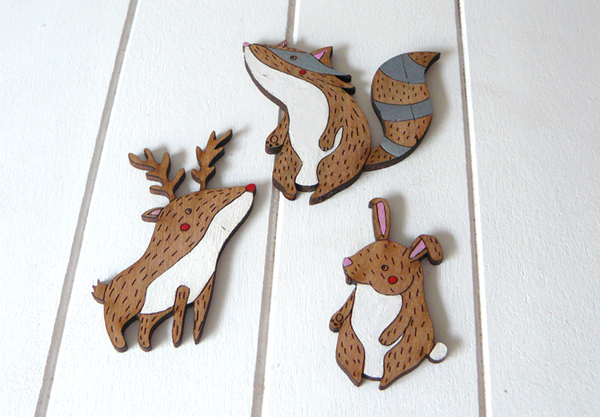 That meant finding a local small laser cutter, sourcing the wood from a local supplier and even down to making sure I was supporting my local art store, by buying my paint from them. I wanted to do my very best to support local business, even if the product wasn’t made locally. Each piece is cut from Tasmanian Blackwood veneer, locally cut within the CBD, and are hand painted, stitched and pieced together. 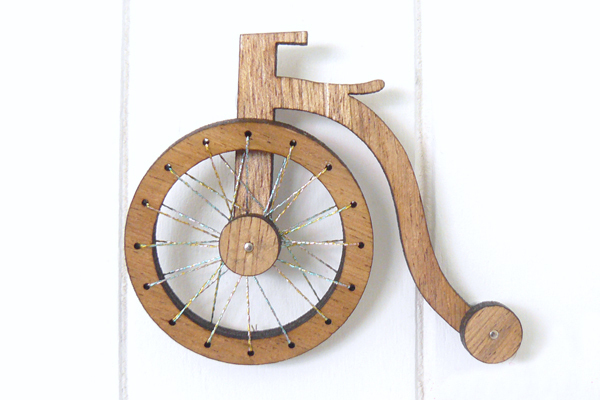 We also like to integrate little bits of fabric and string, as well as pins to create movement in the pieces – like the car and penny farthing brooches. All of the concepts start on paper – I am a big believer in thinking on paper before the computer comes into the equation. Especially the illustrated pieces, all of these are hand drawn and then scanned in and manipulated to become cuttable files. 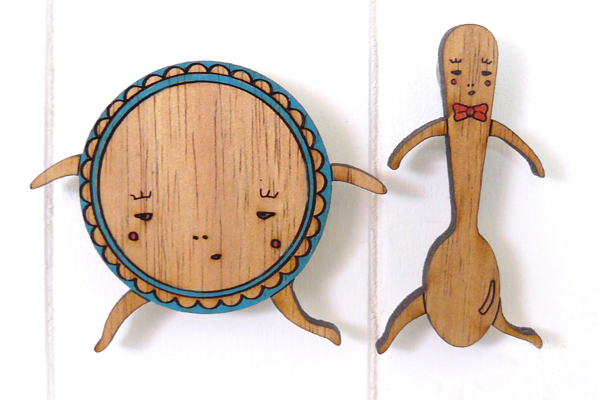 After they are laser cut, it’s just a matter of paint, stitch, glue and we’re done. It’s all rather fun. Where do you go for inspiration, and what are some of your favourite indie labels? I find inspiration in all sorts of places, just as so many other creatives do, but most of all, I’m so inspired by my local community of makers. I don’t need to look far for inspiration – Melbourne has this great vibe within the craft community and I am so inspired by so many people and their commitment and dedication to their craft, especially those that do it full time. My favourites (and friends) are Dawn Tan, Harvest Textiles, Simply Phoebe, the Hungry Workshop, Pom by Pomegranate, Made by White, Monolog and so many others… Their passion and dedication to doing what they love is the most inspiring. What are your aspirations for So Little Time Co? I write down goals for So Little Time Co. every year, and last year I achieved most of them, especially the one where we started making baby mobiles – that was fun! Short term, I’d say more markets, a long overdue website and blog update (which I have been working on so watch out for that) and maybe a bit more of a branch out product wise. Long term, my husband is always telling me to make things for men… so probably something along those lines. What things have your learnt about managing a label, and what advice would you give to others? It sure has been alot of work. I know everyone who starts a little business says this, but it really is true. If it’s not the website needing updating, its the new business cards, or painting new stock for the next market or updating stock level records, or posting an item to a customer – the list goes on and on really – and as soon as you’ve got to the end of the list, you usually have to start all over again, and for me it’s not even a full time thing. There has also been alot to learn about the accounting and business side, and even the little things like visual merchandising and taking good product photos. It’s been such a steep learning curve and I have no doubt I have more to learn, but despite the lack of sleep and the never ending list, it’s be hugely rewarding and so much fun. The amount of creative satisfaction I have gained has far outweighed everything else and getting to the end of that first year and saying to myself “I started a business” was such a good feeling. I say this to anyone who asks about starting a little business – do it! It’s really such a rewarding feeling and all the hard work completely pays off when you know that none of it would have happened without you. You have to be dedicated and passionate about it, and I’d say ask lots of questions, email people who have done it and research before you start, but don’t let the logistics of it daunt you. Especially if it’s just for fun!